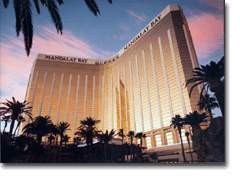 One of Las Vegas newest, and most exciting hotels, the Mandalay Bay Resort & Casino, located at the south end of "The Strip," next to the Luxor Hotel & Casino. Tropically themed with mystical architecture and lush surroundings, the Mandalay Bay will offer an exciting and elegant experience for the Las Vegas visitor. The hotels 3,700 rooms and suites offer a wide variety of accommodations to please all of their guests. The standard deluxe room will average 515 square feet and include many upscale features such as: a desk with two chairs, his and hers lighted closets, two phone lines with computer and dataport capabilities, a 27" color television in an armoire, floor-to-ceiling windows, and an iron and ironing board. The standard deluxe bathrooms offer a separate soaking tub and shower, twin vanities, makeup mirror, a third telephone, and hairdryer. For dining, the Mandalay Bay cant be beat. With fifteen restaurants, a world-class dining experience can be enjoyed. The restaurants include the Aureole, a Wolfgang Puck concept, Shanghai Lilly, Border Grill, Rock Lobster, Rumjungle, Red Square, Raffles Café, the Noodle Shop, Bay Side Buffet, theFour Seasons Café and the new 3950 Steak House. A lush 11-acre tropical water environment comprised of sand-and-surf beach, a lazy river ride, a variety of pools and a jogging track will provide a remarkable recreation and relaxation experience. Guests will find Mandalay Bays spa one of the worlds finest. The spa encompasses 30,000 square feet and offers comprehensive services and exercise equipment for men and women. 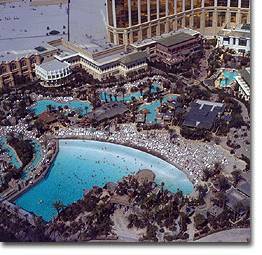 The Mandalay Bay resort is proud to introduce "Storm" in the spring of 2001. A 12,000-seat sports and entertainment complex will be offering superstar concerts, major sporting events and television specials. An outdoor stage at the beach will provide additional facilities for events and concerts. Several lounges, clubs and stages will offer a variety of entertainment nightly such as the exciting "Shark Reef". Visit the Luxor Hotel and Casino and the Excalibur Hotel and Casino by our overhead monorail transport. Located just off the casino is a world famous House of Blues, offering a live music venue and restaurant.